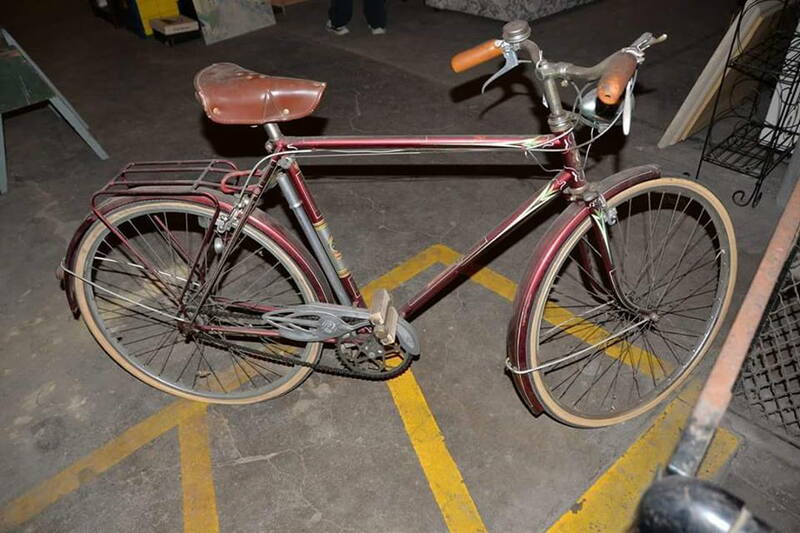 I think every ride on this old beauty will be a "special" ride so one wheelset should suffice. Part of its value to me is to be able to take it for a spin at a moments notice. The old Brampton rear hub cleaned up nicely as well. Found some online pictures of a Royal Nord Commander that looks similar to the RN President. No other info. Looks very nice! Aaah. That satisfied feeling that comes with a smooth bottom bracket rebuild and a carefully filed cotter. I liked setting up the BB with the clamp bolts then the lock nut. No change in bearing clearance when the lock ring is tightened. Thank you for that. I never realized it was that big an issue BITD. Bit before my time, too. WRT the name: as there apparently was also a Commander in the line-up, it might not be related, but rather a marketing choice similar to Opel's. At the time their line-up of cars featured the KAD models: Kapitän, Admiral and Diplomat. 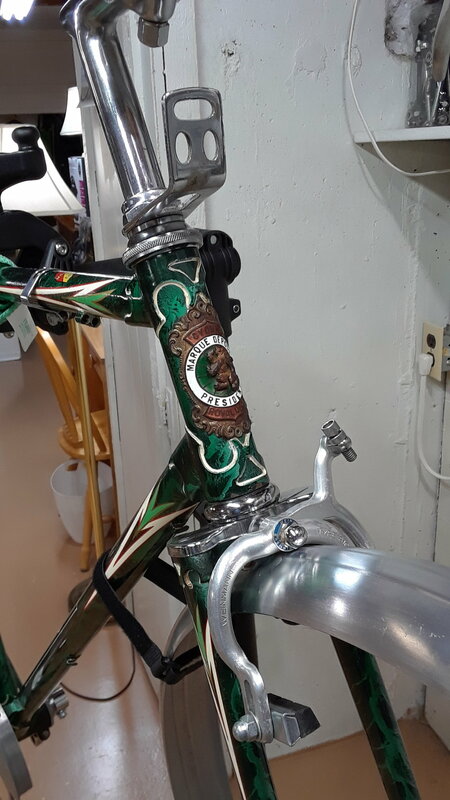 That is an outstanding bicycle. Everything from the EXCEPTIONAL marbled finish, the conspicuous head badge and decaling, and the alloy parts... Wow! 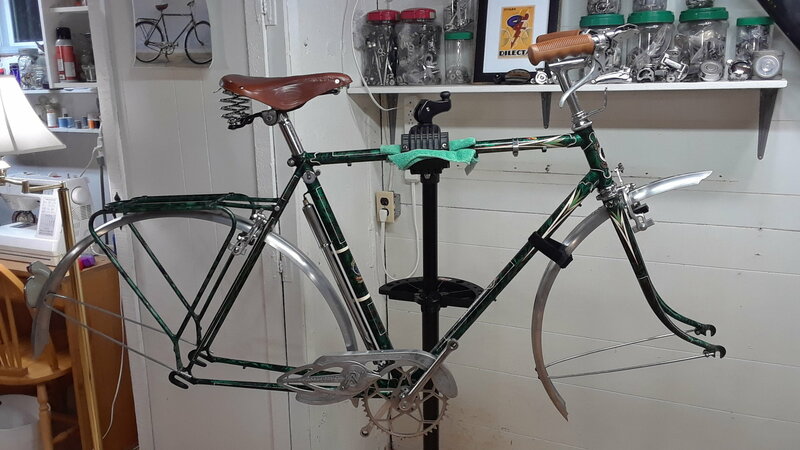 I don't know a whole lot about mid-century bicycles- but from what I do know- that sure looks like a really classy machine- and you're doing a great job with it! 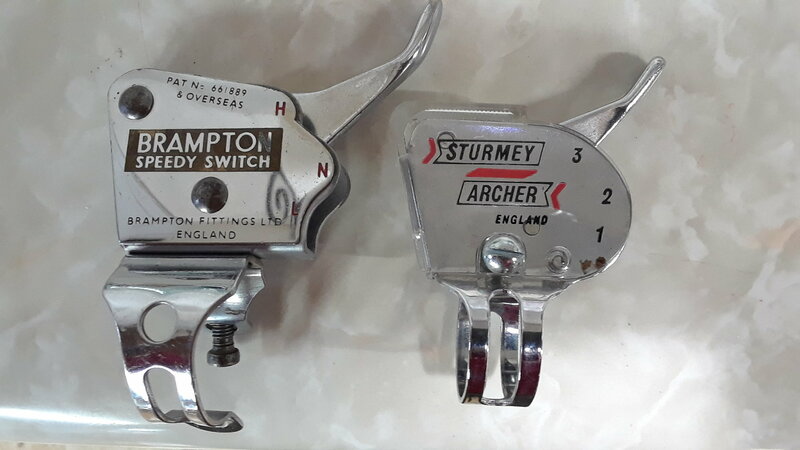 The Brampton Speedy Switch is larger and almost double the weight of a typical Sturmey Archer of the period. 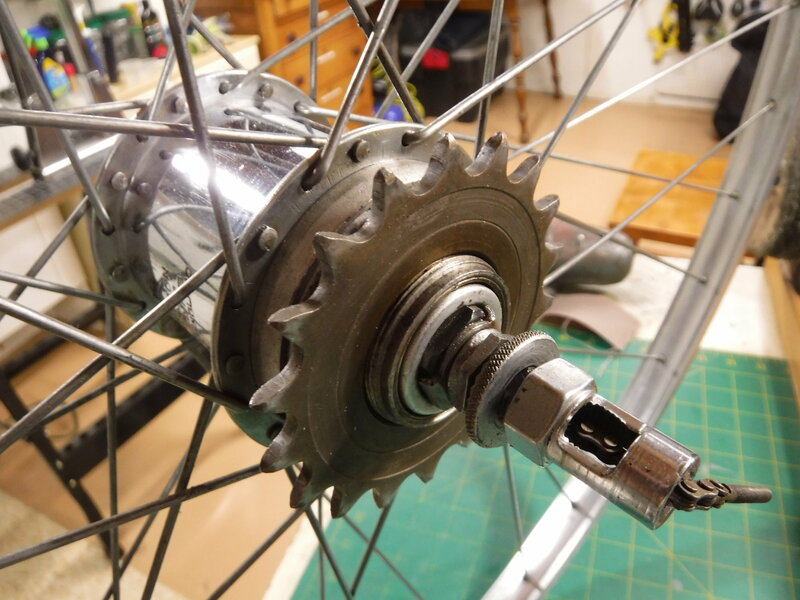 The hub appears to different as well with the threaded cog. I have flushed the hub and will not be dismantling it at this time. Ordered these Vredestein Active Tour in 40-635 for the Royal Nord President. Now we wait. This is an incredibly cool bike. The paint and lining are stunning. Thanks for sharing the process! A sneak peek as it is coming together. 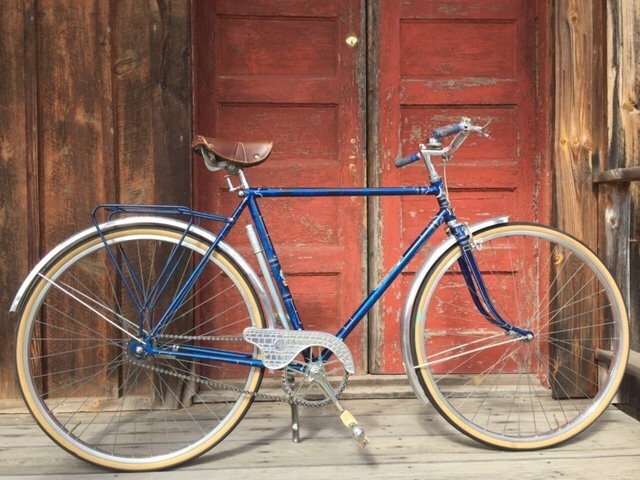 Beautiful bike, I have Schwalbe Cruiser tires on 2 bikes with 635 ERTO rims. Very nice tires and smooth ride. 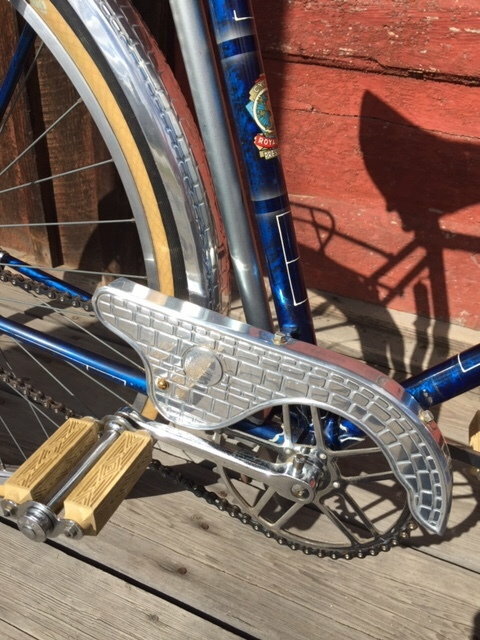 Is there a chance that this bike might have a different thread pitch on the seemingly 9/16" pedals. 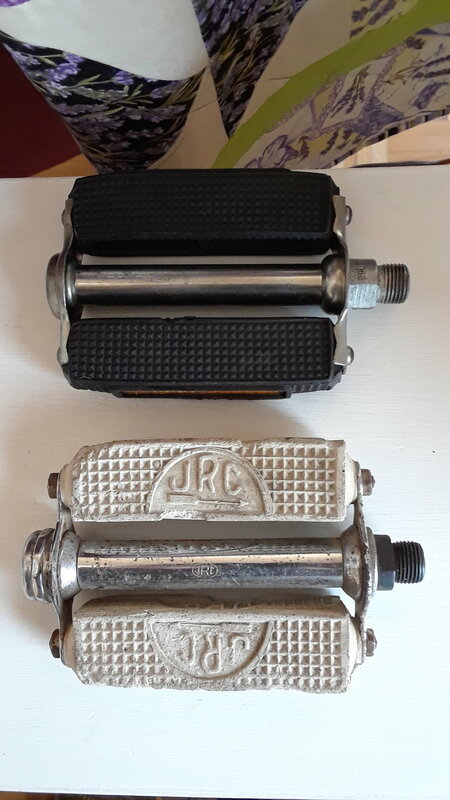 The original JRC pedals are very brittle and I ordered a set of new MKS rubber block pedals. 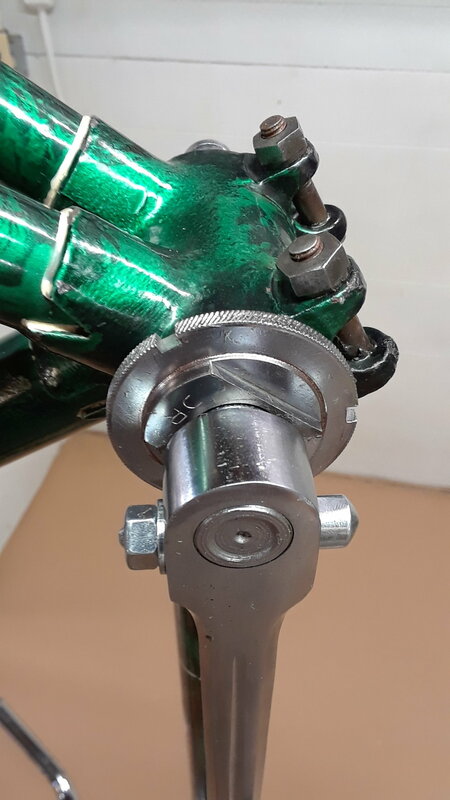 When I tried to install a set of Raleigh type pedals, they started to bind about half way inserted. 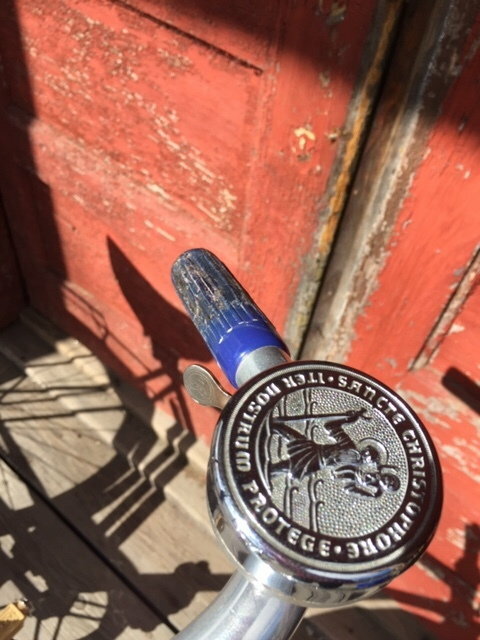 A friend suggested I run a tap through it, but I don't want to take a chance and ruin the beautiful crank set. The tubes in the tires still hold air and have no patches. 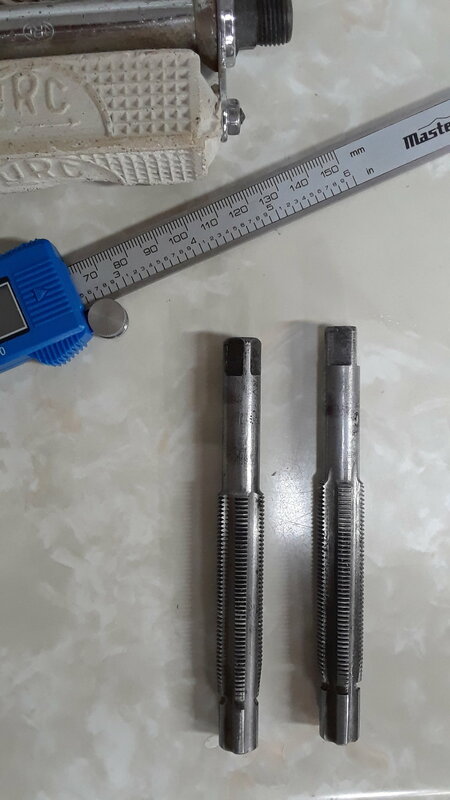 Both are Dunlop Air Seal Made in Canada with metal stems. The tires were Dunlop Imperial Made in Canada. They appear to be original. The rubber is hard and cracked on the tires but the tubes feel like new, but twice as thick as modern ones. One tire got shipped, and the other is lost somewhere where between Canada and the UK. 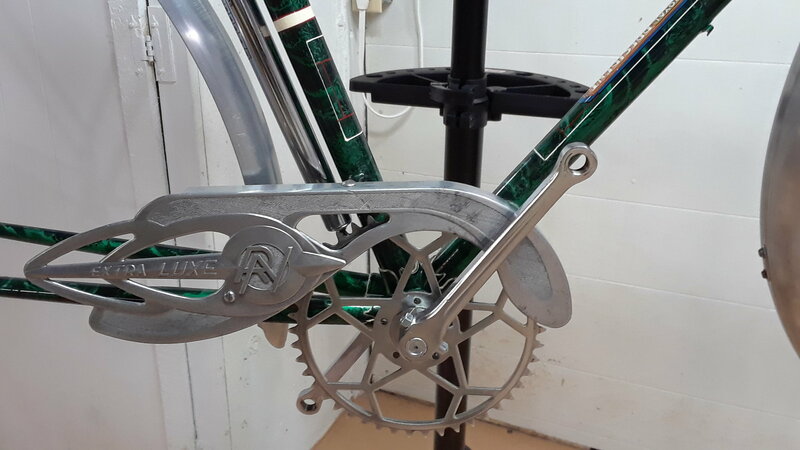 Have you considered taking the new pedal blocks off and putting them to work on the original pedal frame? It is a good idea and had not considered until now. The only block pedals I have are slightly too short and there is more rust than I like on the old pedals. I haven't done it yet but I think I will retap. The number one priority with all my old bikes is that they are nice riding condition. If they sit too long not ridden, I tend to put them up for sale. Looks like you have had a good spring with two folders! 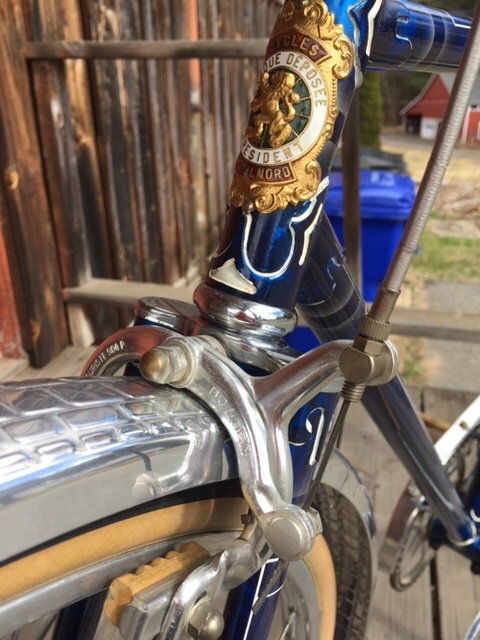 This amazing Royal Nord President belongs to @Ronbo Fomby and he has asked me to post them for him. He has family documentation showing it to be pre fifties! Hope to see more pics soon. 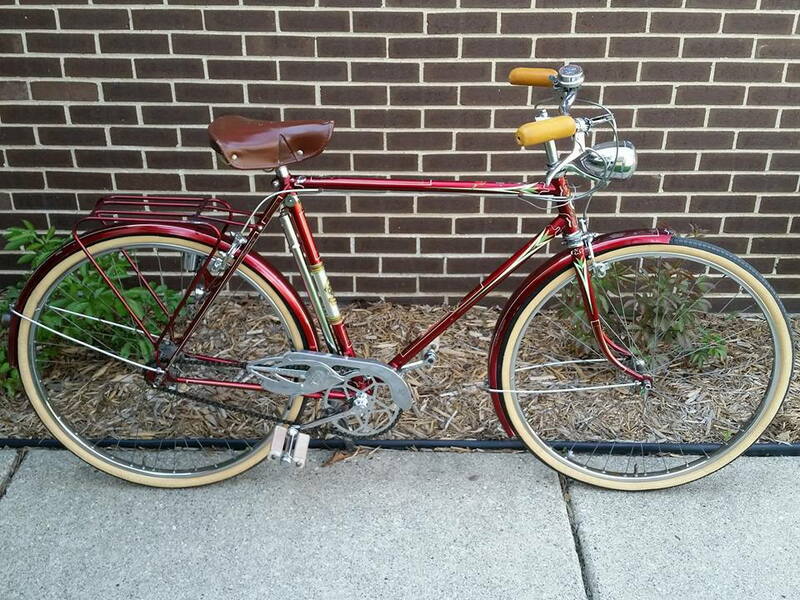 Seeing the similarities of this bike with mine is making me think mine could well be fifties as well. 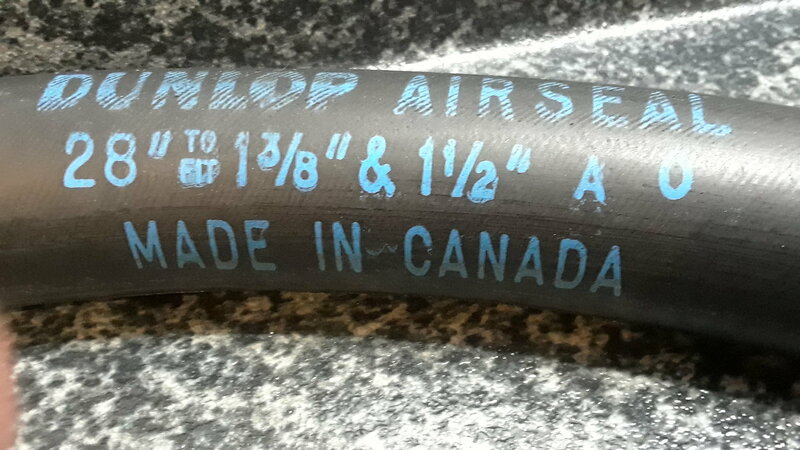 The 28 x 1 1/2 markings on the Dunlop Imperials and Dunlop Air Seal tubes seemed familiar to someone versed in Raleigh Roadsters. It did not occur to me that all was not as it seemed. I made the assumption it was 40-635 (28 x 1 1/2). I guess you know what happened next. 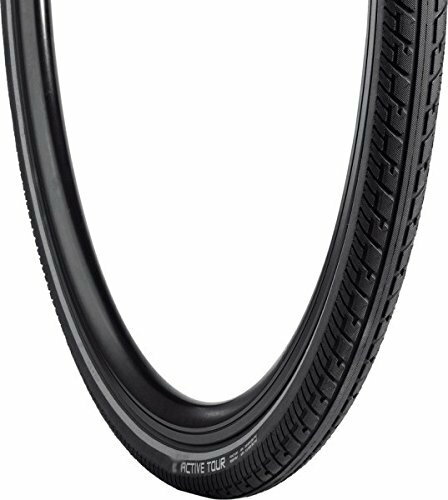 After weeks of scouring the market for 40-635 tires and ordering two, one of which still has not arrived (carton1 of 2, shipped in mid march) A local mobile shop had one Schwalbe Marathon which I also purchased. Had time today to try mounting up a tire. It slipped right over the rim! Did some research and measurement and find that it is likely 700C. Off to the LBS with the front rim to try one and indeed it is a 40-622 (700c) rim. Who knew? He will order something for me when I find what I want. I love it when you update your thread.” A tale of two tires” huh? 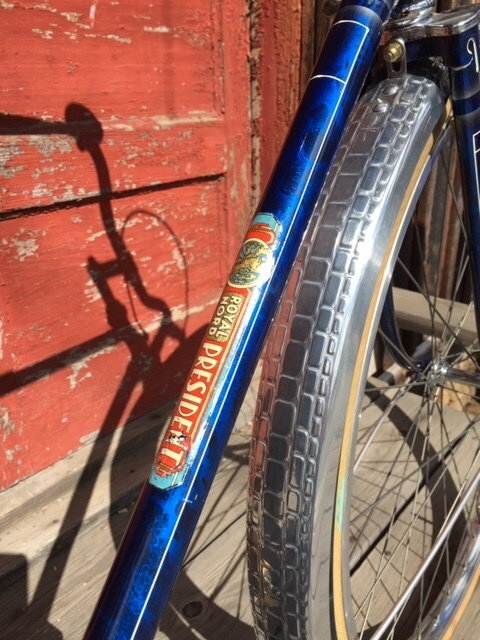 Because of my various earlier bikes, I'm very surprised of the blue "pre fifties president" presented above. The single speed torpedo doesn't fit well with a top of range version. 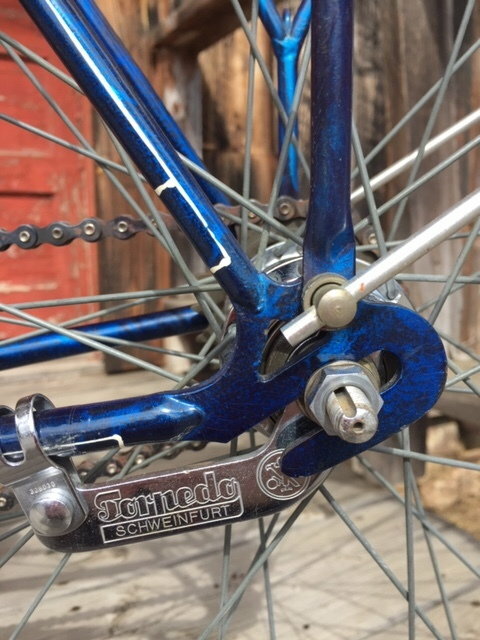 Mostly these were using early Sturmey with the quadrant selector and drums. After finding the shaft on the JRC left pedal was slightly bent, my decision was made. I stopped by my local LBS and once again borrowed his 9/16" right and left pedal taps. The well oiled (and well used) taps did a nice job and a standard pedal thread now threads in easily. Surprisingly the old French thread pedals also went in the newly tapped holes.